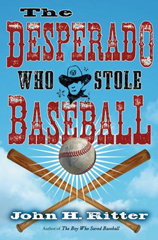 "The Desperado Who Stole Baseball has it all—rich baseball lore, a rollicking Western adventure, and storytelling gold. The gruff-and-tumble founders of Dillontown, California, were a scrappy bunch. From fistfighting misfits and cattle rustlers to gold-digging drunkards and cardsharp hustlers. And that's just the women. The men were all that, plus they smelled bad. This is the magical book that reveals the secret behind Dillontown and Cruz de la Cruz. • Who is Cruz? Where did he come from? • What does outlaw Billy the Kid have to do with all of this? • How did a runaway slave shape Cruz's thinking and the values of a whole town? • Who was the man behind the ban that kept African Americans out of baseball? Order The Desperado Who Stole Baseball here.